Back in the summer of 1947 two men were born within a couple of months of each other on opposites coasts of America and little did they realise that from school age they would share the same passion and desire, as well as the same band, for the rest of their lives….so far. 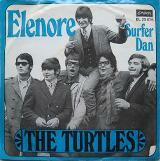 Those two men were Howard Kaylan and Mark Volman who were the two mainstays of the sixties band The Turtles. The line-up changed several times in the six years they were together, but because Howard and Mark were the joint frontmen few people realised. Howard, who was born Howard Kaplan, was born in New York but the family moved to Los Angeles and the pair both grew up in Westchester but attended different schools. Howard learned saxophone and Mark took up clarinet and they had private tuition with the same teacher which neither of them realised. They both sang in the same local choir and one night at a 10th grade dance in 1961 Mark turned up and saw a local band called The Nightriders, on stage with a familiar looking saxophonist, it was Howard. The band were tight and comprised guitarist Al Nichol, bass player Chuck Portz and drummer Don Murray. Mark wanted to join the band, but they had everything covered, so they let him help with a few roadie jobs and they also let him stand on stage and play tambourine, due to his persistence he even ended up singing a couple of songs and enjoyed the added bonus of being paid five dollars a night. Mark wanted more so after saving enough money he went out and bought his own saxophone, learned to play it and eventually became an official member of the group. They then changed their name to the Crossfires. After a couple of years, and with their popularity increasing, they added a rhythm guitarist called Jim Tucker and secured a residency as the house band at a club called Revelaire in Redondo Beach. After a year, and without a pay rise, they were not happy and wanted to move on, but that displeased the club owner who told the band that if they stayed he would get a couple of music industry people in to check them out and maybe even get a record deal. They agreed and the following week two ex-Liberty record staff, Ted Feigan and Lee Laseff who had just started their own White Whale label, turned up with the view to signing some new acts. They were impressed and signed them as the first act to their fledgling label, but the only thing were weren’t keen on was the name and suggested they changed it. The first suggestion, which was quickly dismissed was Six Pence and then someone suggested The Tyrtles – employing the tactic the Byrds used. Everyone agreed on the name, but preferred the traditional spelling. The first song they recorded at the suggestion of the label was a cover of Bob Dylan’s It Ain’t Me Babe which was swiftly followed Happy Together, a song that two members of The Magicians, Gary Bonner and Alan Gordon, had written and touted around to several bands who had all turned it down. Eventually the Turtles got to hear it and agreed to record it, it paid off by reaching number 12 in the UK and number one in America knocking the Beatles’ Penny Lane off the top. The follow up, She’d Rather Be with Me, which was written and produced by the same team, reached number three Stateside and number four here. Four further singles were released which were midway hits in the States and missed altogether over here. By this time they started writing their own material. The record company were desperate to get another big hit and told the band to come up with something like Happy Together. Mark and Howard were not happy about being hounded in this way so decided to throw something together, a really cheesy clichéd song in the hope that it would flop, that song was called Elenore and as Howard explained in the sleeve notes of The Turtles’ Anthology Solid Zinc, “Elenore was a parody of Happy Together. It was never intended to be a straight-forward song. It was meant as an anti-love letter to White Whale (our record company), who were constantly on our backs to bring them another Happy Together. So I gave them a very skewed version. Not only with the chords changed, but with all these bizarre words. It was my feeling that they would listen to how strange and stupid the song was and leave us alone. But they didn’t get the joke. They thought it sounded good. Truthfully, though, the production on Elenore WAS so damn good. Lyrically or not, the sound of the thing was so positive that it worked. It certainly surprised me.” So that plan backfired because it reached number seven here and number six over there. The one thing that did annoy Howard was that the band once had an agreement that any song written by any member of the group then the whole band would be credited and Elenore was written solely by Howard. Mark and Howard became increasingly unhappy with the direction their music had taken and were having endless and tedious litigation over financial issues with White Whale and so they decided in 1970 to disband. Volman and Kaylan remained first friends and were both interested in exploring the edgier side of music and so they both joined Frank Zappa’s Mothers of Invention under the pseudonyms Flo and Eddie. They later did a lot of session work and provided backing vocals on Alice Cooper’s 1980 album Flush the Fashion and can also be heard on Bruce Springsteen’s 1980 hit Hungry Heart. In 1983 Volman and Kaylan won the legal right to the Turtles name, and have toured regularly ever since. In September 2015 it was disclosed, on a now-deleted Facebook page by Mark Volman that he’d been having health issues, he said, “I’ve been meaning to tell you what I’ve been doing on Fridays. In the middle of the summer tour, I was diagnosed with throat cancer, I’ve started chemo and radiation and will be done by the end of October. If everything goes accordingly to the doctor’s treatment, then we’ll see each other again someday.” In February this year he was given the all clear and a couple of months ago were back on the road under the banner ‘The Happy together tour’ with fellow musicians Chuck Negron of Three Dog Night, Gary Puckett & the Union Gap, The Cowsills, Spencer Davis and Mark Lindsay of Paul Revere & the Raiders.